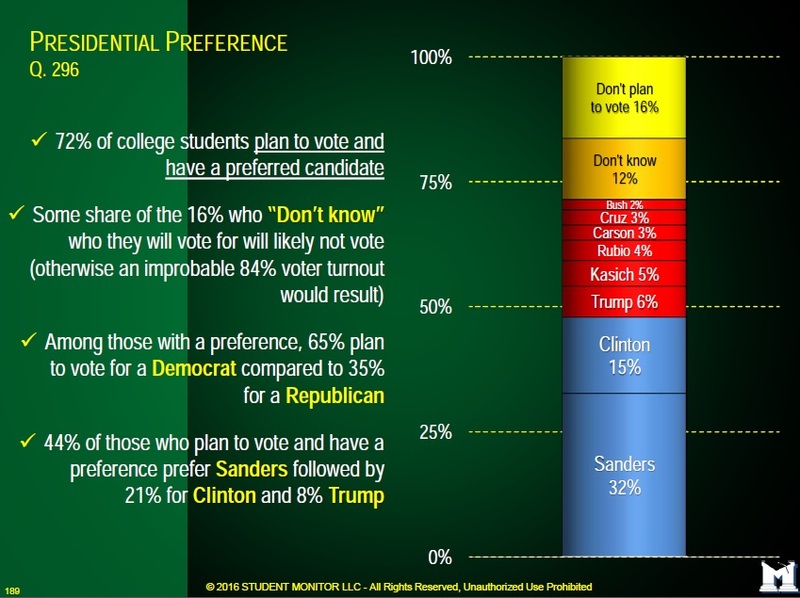 Preliminary results from a national survey of college students found that Senator Bernie Sanders, the independent from Vermont who is seeking the Democratic presidential nomination, is students' preferred presidential candidate by a wide margin. The survey of students at 100 four-year university campuses, which seeks to be representative of the nation's undergraduate population, found that 32 percent of respondents prefer Sanders. Hillary Clinton, the former U.S. secretary of state and candidate for the Democratic nomination, was second with 15 percent. Donald Trump, the businessman and former reality television star who is seeking the Republican nomination, had 6 percent. John Kasich, the Republican governor of Ohio, was next with 5 percent. About 16 percent of respondents don't plan to vote. And another 12 percent said they don't know for whom they will vote. Among those who plan to vote, 44 percent prefer Sanders, followed by 21 percent for Clinton and 8 percent for Trump. When will you get to Ramsgate?